We use the Grakn knowledge graph to show how data scientists can use knowledge graphs to efficiently draw insights from big data sets. Ever since we've been able to sequence proteins, three-dimensional structures have received tremendous experimental attention. Thanks to the development of new methods and technological advancements, determining these structures has become a more accurate and progressive process over time. The problem, however, lays in the fact that the progress of discovering new protein structures has not kept pace with the rate at which new sequences are being produced. As a result, we see a continuously growing gap between the number of new sequences being produced and the three-dimensional structures being identified. Given sufficient accuracy, a possible solution is the computational prediction of protein structures. Methods such as homology modeling, fold recognition, and novel modeling can be used to fill in this gap. However, regardless of which method is used, with the rapid rise in the amount of sequence data, the underlying problem continues to be the lack of one single knowledge base that allows a rapid and powerful scan over the universe of protein sequences. All publicly available data currently sits in various databases across many different sources. Moving from one source to another is not — and certainly must not — be the biggest challenge in this process. query for insights over one single, comprehensive, and interconnected dataset of protein sequences. search and produce a shortlisted set of sequences to be passed on to the next computational component in the prediction process. The image below illustrates how I think the model of a knowledge graph in this domain of protein sequence structure could look like. This Grakn knowledge graph plays the role of a single knowledge base that contains all relevant data pulled in from various sources, such as Uniprot and PDB. The data could also be pulled in from running BLAST with Grakn. Migrating data to Grakn: To learn how data in CSV, JSON, and XML formats can be migrated to a Grakn Knowledge Graph, have a look at the comprehensive and step-by-step Migration Guide. Now that we have all relevant data represented (as shown above) in a Grakn knowledge graph, we can go ahead and ask the following questions over this dataset. Under each question, I've included the relevant query. What are the structures of the following sequence? Which sequences have the structure with PDG id of "2RHC"? The following sequence has no known structure. What are the structures of other sequences that are at least 80% identical to this particular sequence? The code you saw above is Graql. Graql is the language for Grakn. Its expressivity is what makes it extremely human-readable and intuitive. In simple terms, Graql is a query language that can be understood and written by anyone, not just programmers. As we decide to pull in more relevant data sources into the Grakn knowledge graph, the model can evolve and be extended with minimal effort. The commented lines above are the extra code that we need to add. Nothing else needs to change. This extended model of the knowledge graph looks like this now. The extended model: 'function' is added as an attritbute and mapped with 'structure' (directly) and with 'sequence' (via inference). 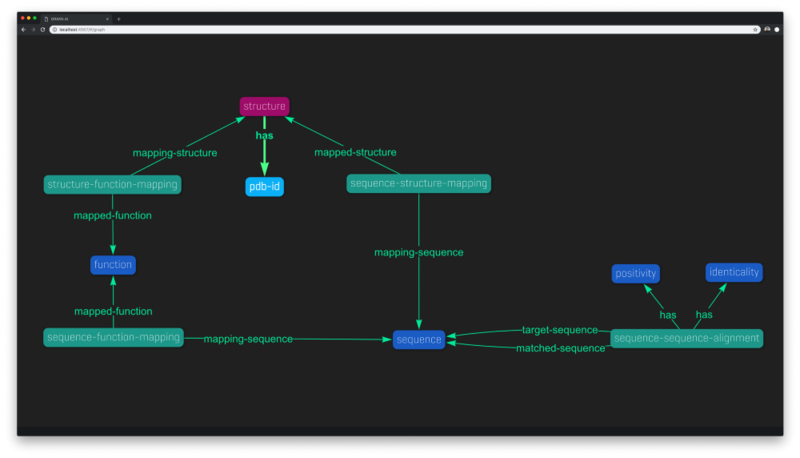 Given the new relationship structure-function-mapping and the previous relationshipsequence-structure-mapping, we can make use of Grakn's automated reasoning capability to make an inference, resulting in new knowledge — the implied sequence-function-mapping relationship. consider the sequence and the function to have a mapping realtionship. Which sequences have the function "enzyme"? Which functions are mapped either directly to the following sequence or indirectly via an aligned sequence a that is at least 80% identical to the given sequence? infer based on new findings (hypotheses). It's entirely up to you how you choose to make your knowledge graph more intelligent by writing rules tailored to your own work. 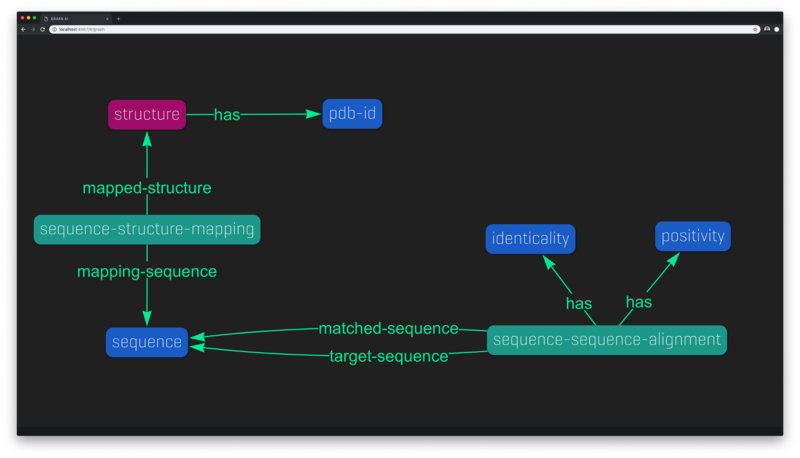 Grakn is about modeling intelligent knowledge graphs in an intelligent way. We believe simplicity to be a cornerstone of intelligence. Hence, the query language — Graql. What you can model and query with a Grakn knowledge graph is only limited by your will and imagination. See an example of the thought process behind modeling a dataset in Grakn. Read about the Schema Concepts, Types and Rules. Go through examples of Graql queries or see how to write your own. Published at DZone with permission of Soroush Saffari , DZone MVB. See the original article here.